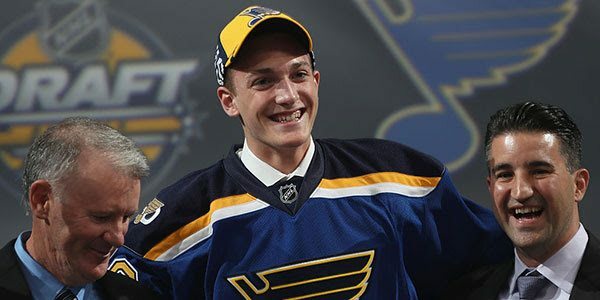 The St. Louis Blues made a total of eight selections at the 2016 NHL Entry Draft in Buffalo. This year’s Draft class includes forward Tage Thompson (26th overall), forward Jordan Kyrou (35th overall), goaltender Evan Fitzpatrick (59th overall), forward Tanner Kaspick (119th overall), forward Nolan Stevens (125th overall), forward Conner Bleackley (144th overall), forward Nikolaj Krag Christensen (209th overall) and forward Filip Helt (211th overall). Below is a summary of all eight Blues draft picks. Thompson, 18, dressed in 36 games during his freshman season at the University of Connecticut in 2015-16, recording 32 points, including 14 goals and 18 assists. In 2014-15, the 6’5, 194-pound forward appeared in 64 games with the United States National U-18 Team, posting 26 points (12 goals, 14 assists) and 32 penalty minutes. In addition, the Oyster Bay, New York, native dressed in seven games with Team USA at the U-18 World Junior Championships, helping the team capture the Gold Medal. Kyrou, 18, has spent the past two seasons with the Ontario Hockey League’s (OHL) Sarnia Sting. In 2015-16, the 6’0, 183-pound forward ranked third on the Sting with 51 points (17 goals, 34 assists) in 65 regular season games, earning a selection to the Canadian Hockey League’s (CHL) Top Prospects Game. In international play, the Toronto, Ontario, native logged eight points (five goals, three assists) in eight games at the 2015 Ivan Hlinka Memorial Cup, helping Team Canada capture the Gold Medal. Fitzpatrick, 18, has spent the past two seasons with the Quebec Major Junior Hockey League’s (QMJHL) Sherbrooke Phoenix. In 2015-16, the 6’3, 222-pound goaltender posted an 18-26-8 record along with a 3.42 goals against average, a .896 save percentage and two shutouts, earning a selection to the CHL Top Prospects Game. In international play, the St. John’s, Newfoundland, native recorded a 3.17 goals against average and a .895 save percentage in five games with Team Canada at the 2016 U-18 World Junior Championships. In 2014-15, Fitzpatrick was named to the QMJHL All-Rookie Team after accruing a 13-11-3 record along with a 3.41 goals against average and a .884 save percentage. Kaspick, 18, has spent the past two seasons with the Western Hockey League’s (WHL) Brandon Wheat Kings. In 2015-16, the 6’1, 201-pound forward collected 31 points (13 goals, 18 assists) in 53 regular season games as well as 10 points (five goals, five assists) in 21 postseason appearances, leading the Wheat Kings to WHL Championship. In international play, the Brandon, Manitoba, native dressed in four games with Team Canada at the 2015 Ivan Hlinka Memorial Cup, helping the team capture the Gold Medal. Stevens, 19, is a product of the United States Developmental Program and has spent the past two seasons at Northeastern University. In 2015-16, the 6’3, 185-pound forward collected 42 points, including a team-leading 20 goals, in 41 regular season games while leading Northeastern to the 2016 Hockey East Championship. In international play, the Sea Isle City, New Jersey, native dressed in seven games with Team USA at the 2014 U-18 World Junior Championships, helping the team capture the Gold Medal. Bleackley, 20, has spent the past five seasons with the WHL’s Red Deer Rebels. In 2015-16, the 6’1, 192-pound forward ranked fifth on the Rebels with 46 points (13 goals, 33 assists) in 55 regular season games. In international play, the High River, Alberta, native served as an Assistant Captain on Team Canada at the 2014 U-18 World Junior Championships, helping the team capture the Bronze Medal. Krag Christensen, 17, dressed in 30 games with Rodovre in Denmark in 2015-16, posting four points (two goals, two assists) and 10 penalty minutes. In international play, the Rodovre, Denmark, native dressed in seven games as an Assistant Captain for Denmark at the 2016 U-18 World Junior Championships, helping the team capture the Division 1A Gold Medal. The 6’3, 201-pound forward also appeared in five games at the 2016 U-20 World Junior Championships. Helt, 18, has spent the past five seasons with HC Litvinov in the Czech Republic. In 2015-16, the 6’1, 194-pound forward posted 46 points (20 goals, 26 assists) in 42 games in the Czech U-18 league, while logging three assists in seven games with the U-20 club.